*A buyer’s premium of 18% of the winning bid will be added as part of the total purchase price on all lots in this sale. Buyers are responsible for applicable sales tax, customs duty and any other prescribed charges. By placing a bid you agree to the terms and conditions of sale. 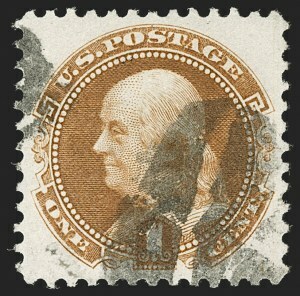 EXTREMELY FINE USED EXAMPLE OF THE ONE-CENT 1869 PICTORIAL RE-ISSUE. Ex Curtis. With 1982 and 2001 P.F. and 2005 P.S.E. certificates (XF-Superb 95; SMQ $2,750.00). Only one has graded higher (at 98) and four others share this grade. EXTREMELY FINE GEM. 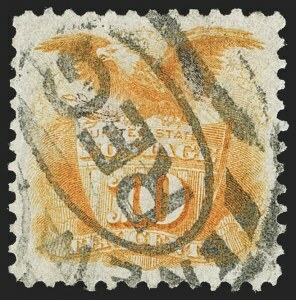 GRADED SUPERB 98, THIS IS THE HIGHEST GRADED EXAMPLE OF THE 6-CENT 1869 PICTORIAL RE-ISSUE IN ANY CONDITION -- EITHER UNUSED OR USED -- AND IT IS SIGNIFICANTLY RARER USED. 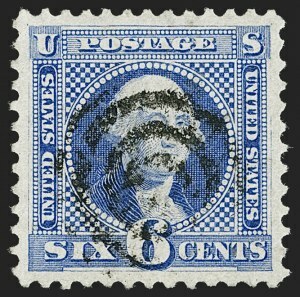 The 6c is one of the rarest of the 1869 Pictorial Re-Issues in used condition. SMQ estimates that approximately 30 exist, and our own informal count concurs. Most are either off-center or have flaws. This superb stamp is certainly the finest of the used population. There are no other 6c Re-Issues graded higher than 95 in any gum condition - original gum, no gum or used (four original gum, one no gum and one used are graded 95). With 2015 P.F. (Superb 98) and 2015 P.S.E. certificates (Superb 98; SMQ $40,000.00). This is the highest grade awarded and it is shared by no others. EXTREMELY FINE GEM. 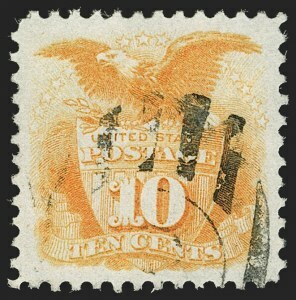 A BEAUTIFUL AND SCARCE USED EXAMPLE OF THE 10-CENT 1869 PICTORIAL RE-ISSUE. This issue is considerably scarcer in used condition. SMQ estimates approximately 30 are known used. With 1999 and 2015 P.F. (XF 90) and 2015 P.S.E. certificates (XF 90; SMQ $6,250.00). Only one has graded higher (at 90J) and only two others share this grade. 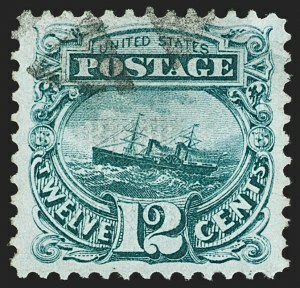 EXTREMELY FINE USED EXAMPLE OF THE 10-CENT 1869 PICTORIAL RE-ISSUE. VERY DIFFICULT TO FIND IN SOUND AND CENTERED CONDITION. With 1991, 2003 P.F. and 2019 P.S.E. certificates (VF-XF 85; SMQ $3,500.00). Only four used copies of Scott 127 grade higher (highest is 90J). EXTREMELY FINE. 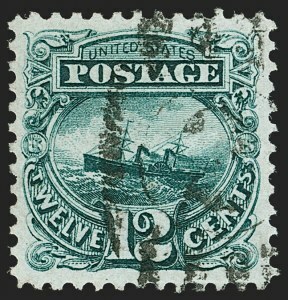 A RARE SUPERB AND SOUND USED EXAMPLE OF THE 12-CENT 1869 PICTORIAL RE-ISSUE. 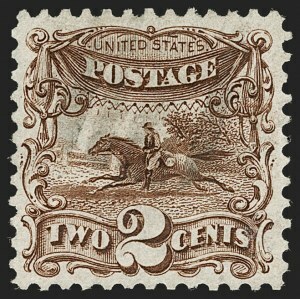 The 12c is the second rarest value of the 1869 Re-issue set in used condition. The Rose book estimates 15-25 extant used copies and SMQ estimates 20 extant. In our opinion, this stamp ranks among the three or four finest. EXTREMELY FINE. 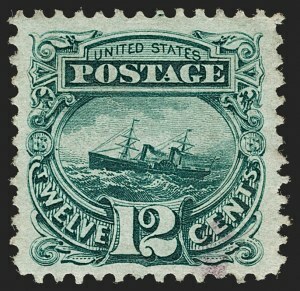 A RARE SOUND AND CENTERED USED EXAMPLE OF THE 12-CENT 1869 PICTORIAL RE-ISSUE. 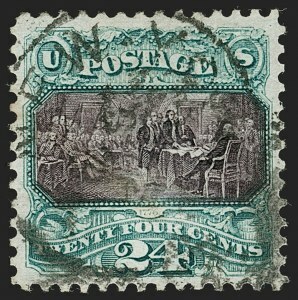 The 12c 1869 Pictorial Re-issue is the second rarest of the set in used condition, after the 3c. The Rose book estimates 15-25 extant used copies, and SMQ estimates 20 extant. It was the only used 1869 Re-issue denomination in the Zoellner collection that was accepted with a small fault. This stamp ranks among a small handful as the finest extant. Ex Dr. Morris and Lessin. With 1991 and 2002 P.F. and 2005 P.S.E. certificates (XF 90; SMQ $7,500.00). Only one has graded higher (at 95) and two others share this desirable grade. EXTREMELY FINE GEM. 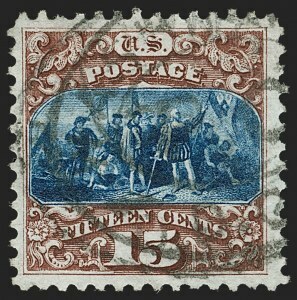 A SUPERB USED EXAMPLE OF THE 30-CENT 1869 PICTORIAL RE-ISSUE, GRADED SUPERB 98 BY P.S.E. THIS IS THE HIGHEST GRADE AWARDED. 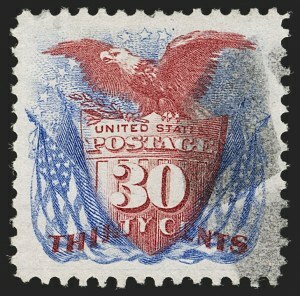 SMQ estimates that approximately 40 examples of the 30-cent 1875 Re-Issue are known used. Our experience has been that many are either off-center or have small faults. The P.S.E. Population Report bears this out as it records only two used stamps at the 98 grade -- this example and the example sold in our sale of the Nick Kirke collection (Sale 1032, lot 3210). Working down the grading chart, two are graded 95 and two are graded 90. With 2009 P.S.E. certificate (Superb 98; SMQ $23,000.00). Only one other shares this grade, and none grade higher. 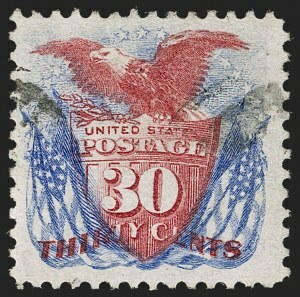 VERY FINE AND CHOICE SOUND USED EXAMPLE OF THE 30-CENT 1869 PICTORIAL RE-ISSUE. SMQ estimates that approximately 40 are known used. Our experience has been that many are either off-center or have small faults or both. This sound used stamp is a desirable example of the issue.